Steve O’ Dwyer and his lucky mango took down the Super High Roller during PokerStars Championship Macau - only two weeks after he topped the PokerStars Championship Panama $10,000 High Roller. O'Dwyer defeated an 88-entry field from a total of 21 different countries to receive HK$8,460,830, following a heads-up deal with Fedor Holz. PokerStars is donating all rake from the upcoming Spring Championship of Online Poker SCOOP Event 15-H: $25,000 NLHE [8-max, High Roller] $2M GTD on May 10 to the meta charity supported by Team PokerStars Pros Liv Boeree and Igor Kurganov, Raising for Effective Giving (REG). PokerStars will also match the first $50,000 in rake collected from the tournament. REG maximises the positive impact of donations by giving to the most effective charities at reducing global suffering in a variety of fields. SCOOP runs from April 30 – May 22 and online satellites are running online at PokerStars now. Players still have a chance to turn €10 into a PokerStars Championship Monte Carlo package worth more than €8,500 by playing fast-paced, special edition Spin & Go tournaments on PokerStars until April 10. Team PokerStars Pro Marcin Horecki had his latest PokerStars winning moment at the WSOP Circuit Event Rozvadov. Earlier this week, Horecki took home €5,136 and the title in Event #6, Seven Card Stud Limit at the King’s Casino Rozvadov. Horecki defeated a field of 49 players to secure his WSOP Circuit ring. PokerStars MEGASTACK LONDON will take place at PokerStars LIVE at The Hippodrome Casino London in the heart of London's West End this weekend from April 7-9, 2017. The £170 buy-in tournament will have a 50,000-starting stack. Episode number of this week’s Poker in the Ears podcast, which is now available to stream or download. This week James and Joe talk to Kenny Smaron – the winner of last month’s PokerStars Championship Main Event. The PokerStars Championship Macau National Championship had a great turnout with 818 entries resulting in tripling the HK$2,000,000 guarantee! The top 159 finishers shared a HK$6,347,680 prize pool. 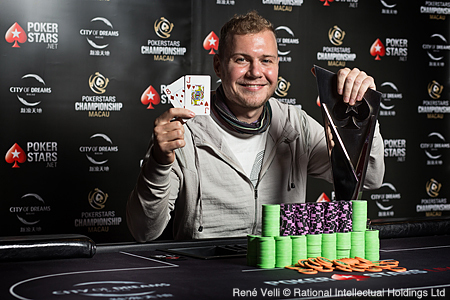 Dutch pro Koen Breed emerged victorious in the HK$8,800 PokerStars National Championship scooping the title along with the coveted trophy and a HK$888,080 first prize. PokerStars Championship presented by Monte-Carlo Casino will take place April 25- May 5 at the glamorous Monte Carlo Bay Hotel & Resort. BetStars has launched its new ‘Big Call’ campaign, an exciting series of social media videos featuring a line-up of sporting stars. The creative video series sees each ambassador make a literal ‘big call’ via video phone, as they share predictions ahead of major events in the sporting calendar. Former England international footballer Wayne Bridge kicked off the campaign by making his predictions on the Premier League match between his former sides Chelsea and Manchester City, which took place last night. To see how accurate Bridge’s ‘big calls’ were go to BetStars social media channels to watch the video.